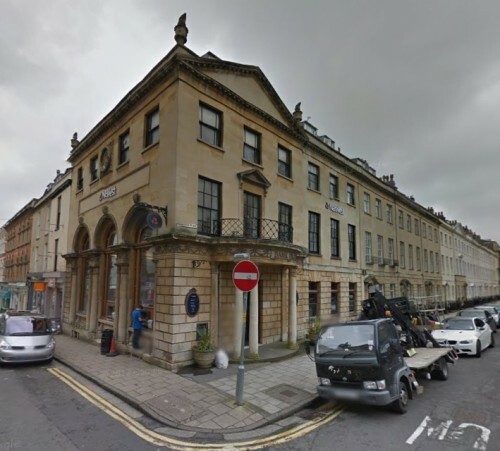 The Trust has learned that the Grade II* listed branch of NatWest Bank on the corner of The Mall and Caledonia Place in Clifton is to close. Built in 1788 and probably designed by John Eveleigh it was altered to a bank in 1922. NatWest have decided that it is no longer viable. Local campaigners, who plan to hold a silent vigil outside, fear that businesses in Clifton Village are losing out to the City Centre. The building’s future is now uncertain though, if current trends are anything to go by, the likelihood is that it will become another bar or restaurant. This announcement follows last week’s news about the closure of the Lloyds branch in Corn Street.